With the expansion of this portfolio into Central America, we’re excited to welcome six new properties in Nicaragua, Costa Rica and Panama that are all operated by the Cayuga Collection, an industry leader in providing sustainable luxury hospitality experiences. Founders Hans Pfister and Andrea Bonilla are both graduates of Cornell University’s Hotel School in Ithaca, New York and dedicated ecotourism professionals. (Hans actually began his career managing the Hampton Inn at the San Jose Airport where he made waves in the late 80s by eliminating single use bath products in favor of refillable bottles.) Together, Andrea and Hans started Cayuga in 1994 with the goal to blend true luxury travel with practices that are both environmentally friendly and beneficial to the local communities. They now manage nine individually owned hotels across the region, of which we are currently representing six. These are Jicaro Island Ecolodge, Latitude 10 Resort, Arenas del Mar , Kurà Design Villas, Lapa Rios Ecolodge and Isla Palenque, a new private island resort along Panama's north Pacific coast. In 2017 Cayuga won the National Geographical World Legacy Award in the Earth Changers category. No Single Use Plastic Bottles or Straws: Tap water at the Cayuga hotels is always treated and filtered to international standards and is 100% safe for human consumption. Guests are encouraged to bring their own water bottles to refill or can borrow one for the duration of their visit. Additionally, the Cayuga properties did away with plastic drinking straws several years ago, replacing these with a robust, compostable bamboo option which was the brainchild of a gardener at the Harmony Hotel in Nosara. Needless to say, he’s not gardening anymore. Sustainability on Display: A mission of the Cayuga Hotels is to educate guests on their sustainability practices, even the unglamorous and often overlooked ones like composting and carefully monitoring exact water to load ratios for optimal energy efficiency in the laundry room. Each property offers a complimentary “Behind the Scenes” sustainability tour to showcase the various ways green practices are implemented. This ranges from using solar panels to heat water to raising pigs to break down compostable scraps in order to produce biogas. Go Natural: You won’t find trimmed grass lawns or perfectly paved walkways at these properties. Most of the hotels exist within the tropical rainforest so lush, natural vegetation is cultivated and in many cases, was left intact and undisturbed when the property was constructed. This equates to more wildlife, especially birds and monkeys who feed on the fruits of established trees. Employ Local: Across the 9 properties and including headquarters in San Jose, Cayuga employs over 400 individuals from Nicaragua, Costa Rica and Panama. Staff at each hotel are 80%-100% from the local community immediately surrounding the property. 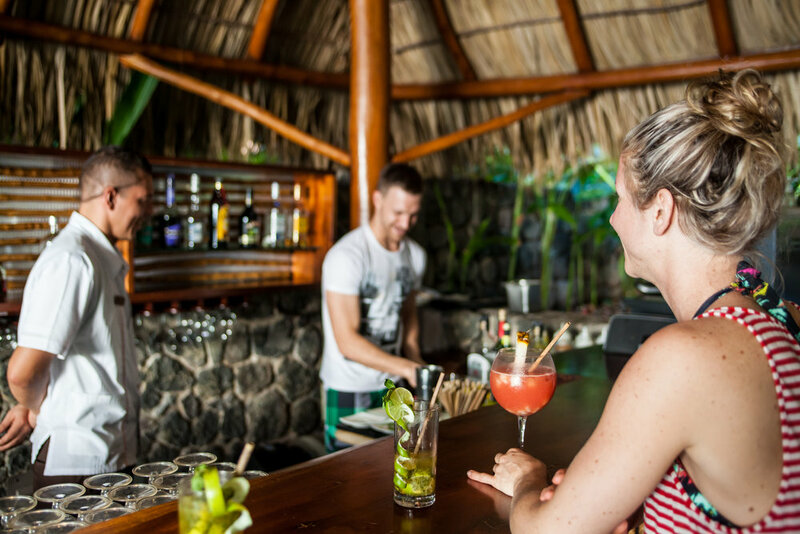 All positions are year round, keeping service standards consistent and fostering cross training among employees who don't have to worry about seasonal layoffs which are typical at many Costa Rica hotels. Eat & Drink Local: Cayuga piloted the global “Dock to Dish” program in Central America - they connect their chefs with local fishermen and only use responsibly caught seafood. This often leads to unique dishes as the hotels all pledge to purchase and prepare whatever teh fishermen bring in that day. Additionally, their restaurants use only grass-fed beef and hormone-free chicken and as many locally produced and organic fruits and vegetables as possible. It's true that the Cayuga Collection properties may not be for everyone; travelers seeking a larger tropical resort experience with AC, dedicated pool butlers, manicured grounds, golf courses or a full gym may be happier with the international name brand resorts typical of Costa Rica's Papagayo Peninsula. But for travelers who seek to experience authentic local culture, have friendly and genuine interactions with members of the community, travel in a style that is environmentally conscious while giving back through travel, Cayuga is for them.